I recently received several emails purportedly from Booking.com, a reputable reservations booking site on the Web (see email image below). Having not booked a hotel reservation, I would normally simply delete this email. However, I was struck by the warning that a cancellation or prepayment penalty of $195 would be billed to my credit card and tempted to click on the link provided in the email. I’m glad I didn’t. I did a little research and discovered that these emails represent a very widespread scam. The scam can work in one of two ways – either with an email attachment or a link within the email. In each instance, whether a phishing expedition or a Trojan attack or both, the result can be potentially devastating for users with sensitive information on their computers. Malware attacks are on the rise and computer users should be on guard against them. However, even the most security savvy among us may – in a moment of weakness – click a link or open an attachment that we will come to regret. Of course, a close look at the email provides us telltale signs that this email is not legitimate. 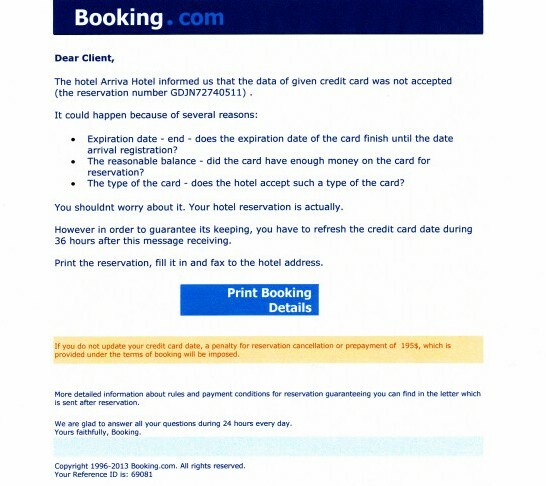 Take a look at some of the grammar in the email like “The hotel Arriva Hotel” and “does the expiration date of the card finish until the date arrival registration.” Also, misuse of punctuation can be indicative of malicious intent, such as the word “shouldnt” without the apostrophe and the “195$” prepayment penalty with the dollar sign following the amount (not typical of an American establishment). Should you receive an email similar to the one below, or any email of which you are uncertain, do not open any attachments or click any links within the suspicious email. You may be saving yourself from the consequences including identity theft, credit card fraud, or costly computer repairs. After reading this article, I’m almost afraid to flush my toilet for fear of getting a virus. Email was originally designed for communication with friends and family, but has transformed into a hodgepodge of nonsense and misinformation and urged by the sender to forward. It seems to be another method to compromise the individual security of honest people. I think the author of this article should be hailed as the Paul Revere of our time. Post writing is fun and it is apparent that you are having fun with this website. Thanks for alerting me to yet another scam.